Do you meet all of the following conditions? We want you! Join the IWW and help us create the One Big Union of all workers. Join IWW by contacting a delegate: IWWBellingham at gmail.com. We have delegates in Bellingham, Mount Vernon, and Everett. The Industrial Workers of the World is a membership organization. Monthly dues are determined by your income. All members have equal rights: election of officers, votes in meetings and union-wide referenda. Membership includes a subscription to the IWW newspaper, Industrial Worker, and the internal members bulletin. Members who are in good standing (dues paid up and a member for a particular period of time) are eligible for office. Maximum Dues = $33.00 (US) per month – if you make more than $3,500.00 (US) per month. Initiation fee is payable only one time, and is equal to your dues. Once you become a member of the IWW, you are expected to keep your membership dues current. You must pay your dues to an IWW delegate. Delegates are dues paying members of the IWW elected by their branch, shop, industrial union, or appointed “at large” where no IWW branch, shop, or local industrial union office currently exists. You may pay dues for as many months in advance as you wish. The best way to maintain your dues is stay in touch with a Bellingham IWW delegate. (1) Why Join the IWW? (2) Ready to Join the IWW Now? (3) Do you have questions about your eligibility? (4) What you need to know about paying your dues. (5) Are you located outside of the United States of America? 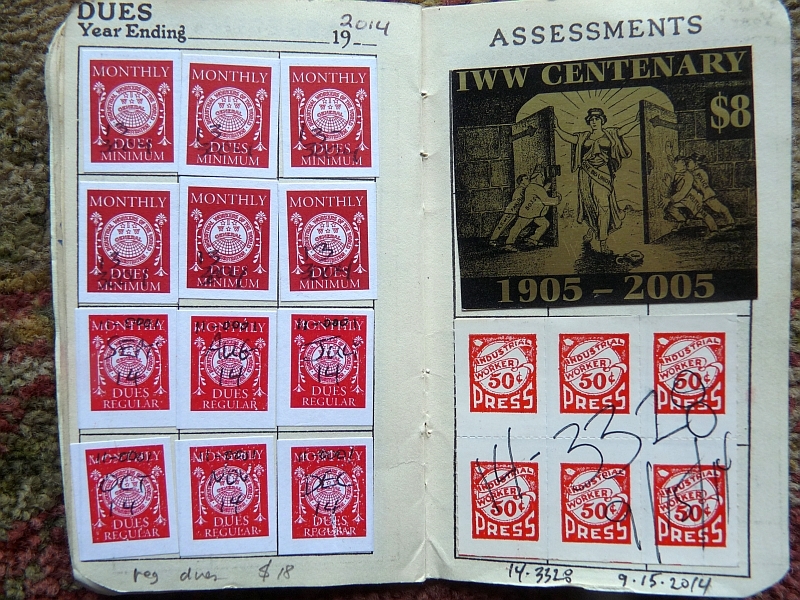 Your red IWW membership card with dues stamps is the ultimate record of your dues payments. A Wobbly red card with dues stamps. Vancouver Island IWW branch see what’s happening with IWW on the Island.